While cowboy boots and their classic pointy toes were originally created in the 1800s to help ranchers quickly get their feet into stirrups, they have since evolved into a widespread phenomenon symbolizing culture, comfort and identity. With Texas’s rich cowboy history it’s no wonder the state is king of the cowboy boot, and Texas offers many skilled custom boot makers creating pieces of art across the state. 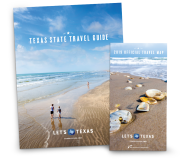 Across Texas, visitors in search of the perfect custom pair of cowboy boots won’t leave empty-handed, and will experience some of the most unique aspects of Texas history and culture along the way. Abilene, Austin and El Paso are famed for cowboy boot creators, but San Antonio boasts one of the oldest family-run operations in the Texas custom boot market. Little’s Boot Company was founded in 1915 and four generations of crafty customizers followed. Little’s offers a wide variety of styles and leathers made from skins ranging from ostrich and crocodile to kangaroo and even elephant. Just up the highway in Austin a must-see for boot connoisseurs is Texas Traditions, a humble workshop located in the popular South Congress neighborhood. True to its name, the shop operates with a deep respect for the heritage of its craft. Owner and designer Lee Miller apprenticed under the late Charlie Dunn, a man dubbed the “Michelangelo of cowboy boots,” a fifth-generation bootmaker who practiced for 80 years and founded Texas Traditions. Country musician Jerry Jeff Walker even wrote a song about him. Miller inherited the business, the techniques, and even the tools while incorporating his own creativity and style into the designs. His creations adorn the feet of an exclusive clientele, including musicians like Lyle Lovett and Slim Pickens and the wait list is several years. In Fort Worth, M.L. Leddy’s is a true legend in the handmade boot industry and one of the oldest and largest custom bootmaking operations in the state. Famed for boots, hats, saddles, clothing, belts and buckles, M.L. Leddy’s is a family-owned establishment that has been operating for 85 years and specializes in old-fashioned high-heel range riders, Nuevo-retro cockroach stompers, tool tops and lace-ups. A pair of Leddy’s boots start at $495, and customers will be in good company as Leddy’s has created boots for the likes of Paul Newman, country singer Trisha Yearwood and basketball star Kareem Abdul-Jabbar. Further north in the Panhandle Plains, Bell Custom Boots has been operating in Abilene for nearly four decades. A family business, owner Alan Bell works with his wife to bring handcrafted quality to customers of all types, with an average turnaround time of 16 months. Also in Abilene is Tex Robin Boots, which was opened in 1944 by Tex Robin and has been operated for the past four decades by his son, Tex Junior. A walk-through of the shop yields exquisite displays of boots with artistic flourishes. Tex Robin Boots has been long engrained in the cowboy lifestyle, as the elder Tex learned to make boots while repairing them on the rodeo circuit in the 1930s. West Texas is home to El Paso, the “Boot Capital of the World.” With major manufacturers such as Tony Lama Boots and the Lucchese Boot Company, as well as specialty boot makers like Rocketbuster Handmade Custom Boots, El Paso certainly as the right to lay claim to the name. Rocketbuster is a colorful workshop specializing in bright, eclectic designs anchored by traditional handmade quality. Owned by Nevena Christi and founded by her husband, Marty Snortum, the shop is nestled inside an industrial-chic brick building in El Paso’s rising Union Plaza district. More than a dozen workers produce 500-plus pairs of boots a year in the shop, which attracts visitors from all over the world including Celebrities such as Oprah Winfrey, Julia Roberts, Taylor Swift and Steven Spielberg. Explore the long-held tradition of custom boot making as it has evolved in Texas, the level of craftsmanship that goes into this unique art and the impact it’s had on Texas culture. It’s a handmade practice that’s been passed down from local legends and continues to inspire a new generation of Texas boot makers.